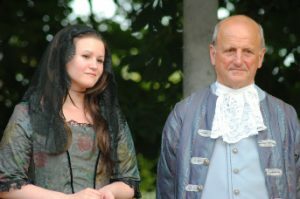 BOURNEMOUTH Shakespeare Players celebrates its 35th anniversary this year with a production of one of the Bard’s most difficult plays, Measure for Measure, in the grounds of Christchurch Priory House. 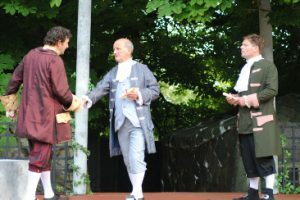 After the downpours of 2012, this balmy summer is a welcome gift from the weather gods, and Tuesday’s opening night was a perfect a setting for an open air play as anyone could wish. 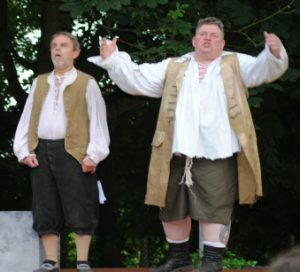 Their backs to the magnificent Priory church and facing the harbour, the audience enjoyed another fine performance directed by company founder Kevin Dicker, who first played Puck in The Dream back in 1979. 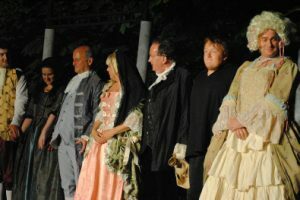 The scene was set for the arriving audience by the inviting mince of Daniel Sutton-Boulton, a madame whose house of sin is central to the moral tone of the play. Then, to the music of Rameau and Lully, the protagonists take their place on the stage and the drama unfolds. The Duke of Vienna, a conflicted man who doubts the wisdom of his very lax approach to implementing his own laws, leaves his realm in the hands of his stony deputy Angelo to travel abroad. 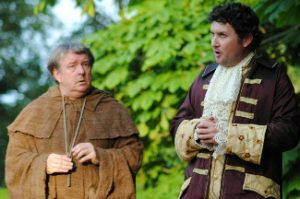 In fact he disguises himself as a travelling friar to observes how someone else runs the show. Angelo takes power with gusto, cracking down on moral turpitude and sentencing to death a young man for having “known” his fiancee before their marriage. 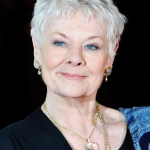 The condemned man’s sister, about to enter a nunnery, pleads for her brother’s life, and the corrupt Angelo offers to alter the sentence if she will sleep with him.So begins the plot in which the Duke arranges a swap under cloak of darkness, and Angelo is hoist by his own petard. Lee Tilson gives another powerful performance as the cruel Angelo, with Rachael Cheeseman as sister Isabella and Alan Freeman as a wonderfully preening Lord Lucio. 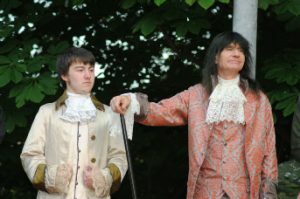 Ryan Gregg captures the indecision and indignation of the Duke, with Paul Nelson as a very funny Pompey. The company specialises in teaching its members how to approach the unfamiliar texts with clarity and energy, and it certainly works in this production, which continues to 27th July.